Located southwest of Wu Yi Shan City, Mount Wuyi is at the border of Fujian and Jiangxi Provinces, and covers an area of 70 square kilometers. Mount Wuyi is renowned for beautiful mountains, and the Wuyi Palace. It was formerly a temple built to offer sacrifices to Master Wuyi, and houses the administration office in charge of affairs associated with the mountain. Later, the term Wuyi Palace extended to include the surrounding area, so that today it refers to both the temple and the region. Occupying about 3.5 square kilometers, Wu Yi Palace is the oldest one with more than one thousands years of history. Inside the palace, there is a pond and a bridge. In the courtyard, stand two cherry bays left by the Song Dynasty. The left one is over 900 years and the right more than 800 years. 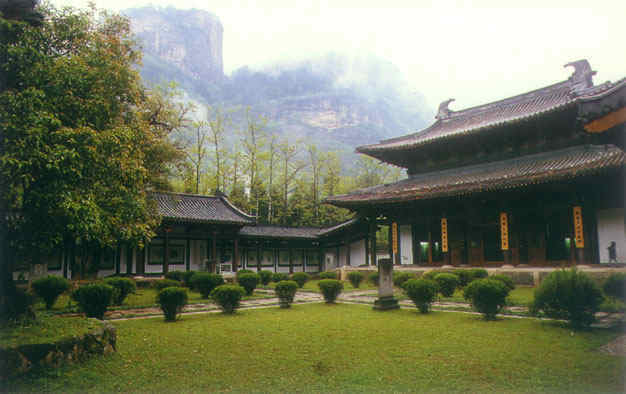 The Wuyi Palace is one of the six famous Taoist temples in China.